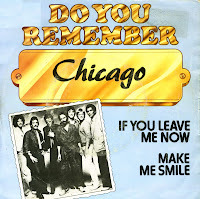 'If you leave me now' was released by the American band Chicago on their 1976 album 'Chicago X'. It was written and sung by bass guitar player Peter Cetera and released as a single in July 1976. The single topped the US charts on October 23, 1976 and stayed there for two weeks, making it the first number one hit in America for the group. It also reached the number one spot in the UK and the Netherlands. The single went on to win Grammy Awards for Best Arrangement Accompanying Vocalist(s) and Best Pop Vocal Performance by a Duo, Group or Chorus. 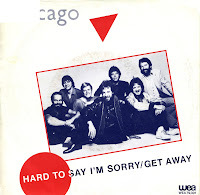 'Hard to Say I'm Sorry', a hit for Chicago in 1982, was written by band member Peter Cetera and producer David Foster. The song hit Number 1 for two weeks on the US Billboard Hot 100 chart. 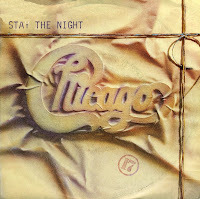 'Hard to Say I'm Sorry' segued into a second song titled 'Get Away', which was closer to the older horn-driven Chicago sound of the Seventies. Deviating from Chicago's practice of having mostly band members playing on their albums, 'Hard to say I'm sorry' featured several session musicians. The song featured three members of the American rock band Toto: Steve Lukather on guitar, David Paich and Steve Porcaro on synthesizers. The song's vocals were performed by Cetera and new member Bill Champlin. I suppose I wasn't the only one who was amused by this video back in 1984. But I do wonder if everyone who saw this bought the single. It didn't chart in the UK, and only reached number 27 in the Dutch Top 40. It did reach number 16 in the US Billboard Hot 100, so I guess the video did enough for the group. According to the information on Wikipedia, singer Peter Cetera supposedly performed most of his stunts in the video himself. Hard to believe when you hear the sappy ballads he recorded in the years after this.